…because it’s a fascinating question, and gives us the chance to “officially” resolve multiple action items from the past year. Some background: late last year, we demoed The Black Brick to a local wargaming group. Overall, they enjoyed the game and most of the mechanics seemed to click with them. We were especially pleased when the Hammer Warrior instinctively played an Ability Card as a response to an incoming attack—even before we had ever mentioned it was an option. In the feedback session after the wargamers’ playtest, their thoughts were varied and broad, touching on Ability usage, combat mechanics (rightly so, given the group), naming conventions, and a few notes on Dice Plate implementation and balance. However, one bit of feedback really stuck with us: that instead of giving a player all 16 Ability Cards to test a game they’d never even heard of before, how about we break it down into loadouts? …is a big “yes.” On the Cultist’s turn, they played Dark Fury to give the Weremage +1 Action until the end of the round, then hexed an overly aggressive Warrior Minion with Agony, which deals 2 Wound Points when the target uses Strength. The foul beast was no match for the Warlock’s horrific Necromongrel onslaught that followed! We’re very excited to see how the game continues to grow. Next post will focus on numbers. Specifically, player count. We’re still tossing the idea around, but we believe our game will be able to support 1-36 players. More on that soon! 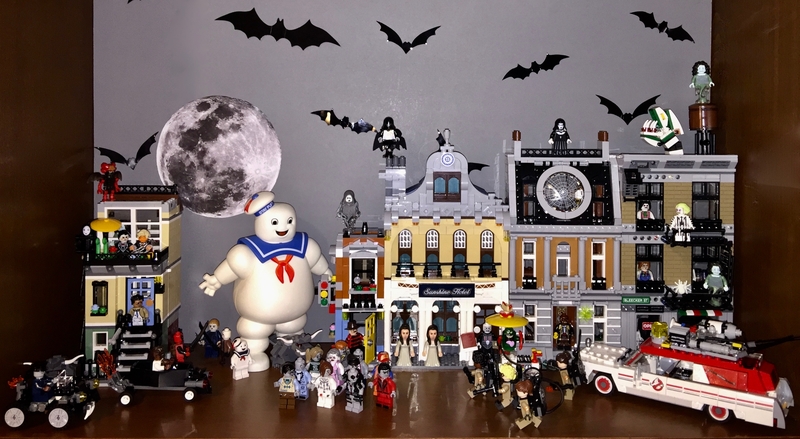 After a few straight years of using the so-called “War on Christmas” as a theme, the 2017 Holiday Display featured the villains and ne’er-do-wells from various fictional universes celebrating an enjoyable, fun-filled holiday. Originally, plans for the 2018 Holiday Display involved a thematic sequel: the heroes and heroines from many of the same fictional realms experiencing a similarly festive holiday. 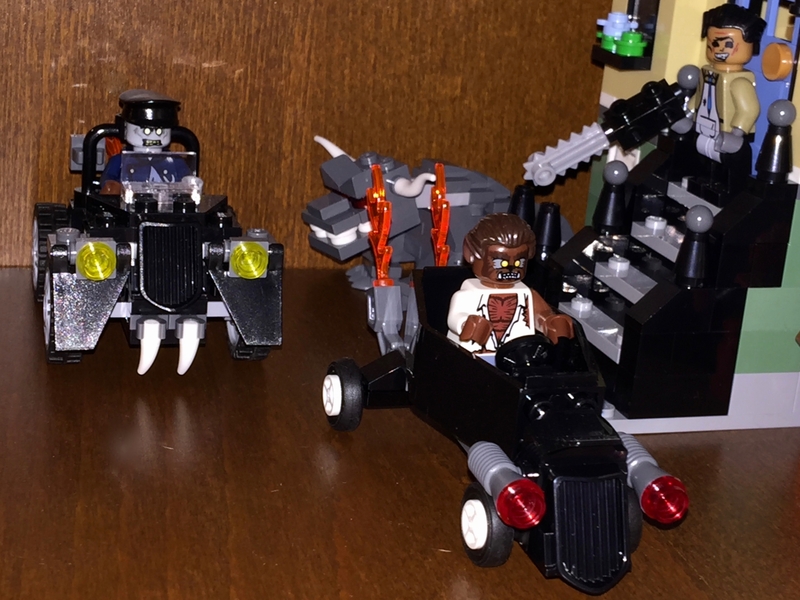 However, Lego’s new Harry Potter sets resulted in a slight change of plans. Instead, it was simply the staff and well-meaning students from Hogwarts enjoying the holiday season. 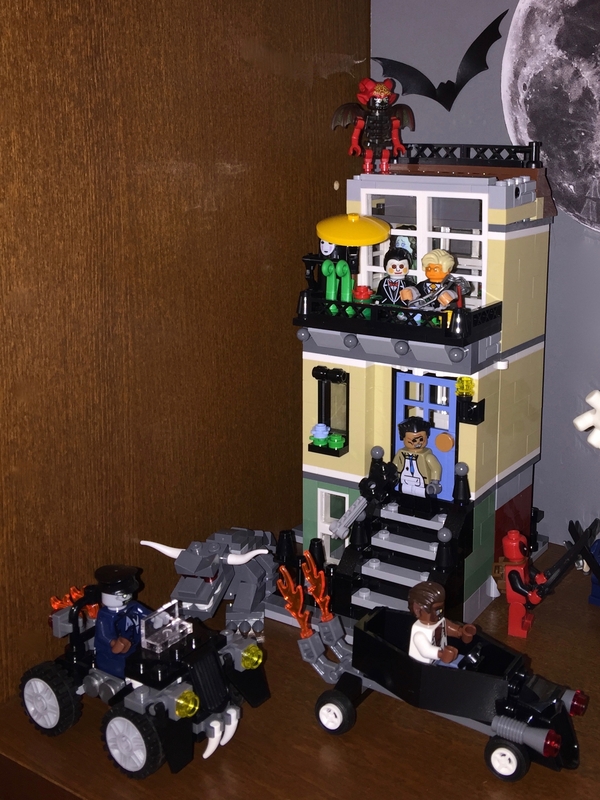 In order to create the proper seasonal atmosphere, which simply doesn’t exist within the Harry Potter sets themselves, I interspersed elements from a number of smaller Lego Christmas sets. The trees, the ice pond, the snowmen, Santa and his sleigh, and the sled all come from such sets. While those elements may have been sufficient to provide the proper holiday feel, additional, smaller elements can also help. 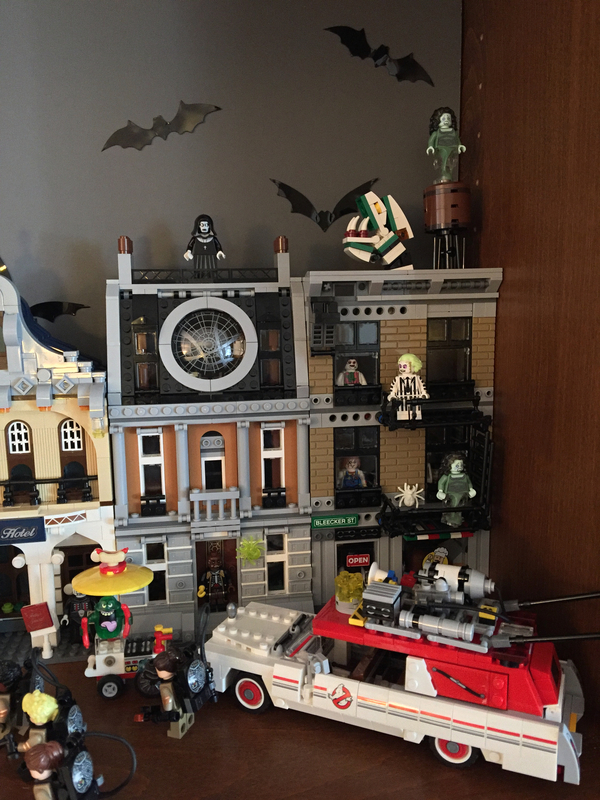 This is where MINIFIGS.ME came rather handy. They offer a large supply of custom-printed Christmas Lego parts, and I couldn’t resist using them to help make Professor Snape and Professor Lupin far more festive. After all, it’s not Christmas in the United Kingdom without crackers. As for the rest, it seemed unimaginative to leave the Weasley’s car in the Whomping Willow. Plausibility be damned, Santa’s sleigh in Hogwarts’s felt like the right thing to do. With Santa’s sleigh temporarily disabled, other flying objects were needed. The Weasley’s car obviously deserved to have a little fun (the movies, at least, suggested that it possessed a personality of its own) and dragons are a part of this world. Thanks to the Ninjago line, there were plenty of options available. 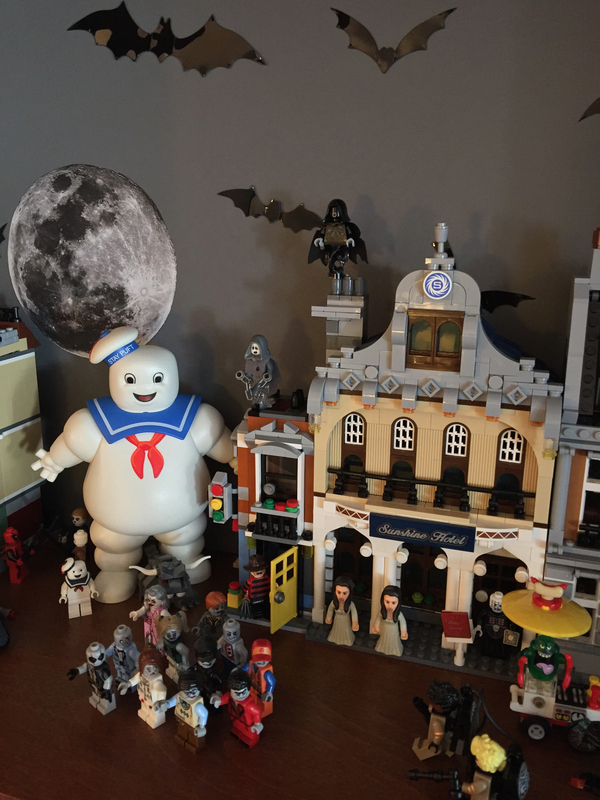 Size became the most important factor in deciding which to use — most of the ones in my collection would’ve overshadowed the rest of the display. Also, given that it was Christmas, reuniting Hagrid with Norbert bordered on being a moral imperative. As has been the case when completing every previous Holiday Display, plans for next year’s are already underway. Of course, with nearly a full year to give it further thought, it’s completely possible that the 2019 Holiday Display will bear no semblance to the current plans. After all that’s what happened this year. Our profound apologies for not posting in a while, but it’s with good reason! Since our last update, we’ve completed two more playtests and have been going though a ton of player notes. Much of the feedback so far has aligned with our own expectations, especially when it comes to Dice Plates. Very early on in the first half of 2017, when we were just starting to toss around general ideas and concepts for The Black Brick, we quickly came to the realization that this wasn’t a game to be played with your standard 1D4, 1D6, or 1D8, etc. One of our guiding principles was (and still is) that if we couldn’t justify a number above 10, then it needed to be reworked. We intended for roll ranges to be far tighter than you’d find in a traditional D&D setting, but that meant we had to come up with a unique dice system that provided us the flexibility and freedom to reinterpret one of the most sacred bedrock fundamentals in tabletop gaming. But how and where were we going to find just the right materials for such a strange, new endeavor? Over the past year, we looked into custom-moulded/printed dice, but that was prohibitively expensive. We looked at basic stickers, but that would have become unwieldy as we’d be burning through tons of stickers during the prototyping stages. We even briefly flirted with the idea of sourcing old LEGO dice from the long-since defunct LEGO Games line, but that would have been similarly expensive and unwieldy. These Dice Plates far exceeded our expectations in our first two playtests back in July and August. Combat was extremely balanced. There were no major surprises—well, apart from the Rage 1/Rebel Strike combo we discussed in our previous post. Everything was generally smooth. That was not the case with subsequent tests, and we quickly realized why. Our first two tests used Tier 1 Heroes, Tier 1 Abilities, and most importantly…Tier 1 Dice Plates. This put the Dice Plate range firmly within 1-3. Our later tests were Tier 2, which saw a significant Dice Plate range increase from 1-3 to 4-9. Ouch. Characters were dying left and right. No Defense roll seemed to be able to consistently save anyone. We saw far too many Attacks rolling 8’s and 9’s against Defenses of 2’s and 3’s. Captains (mini-bosses) were destroying pretty much everything. We wanted combat to be fast and brutal, but this was just too much, too soon. You’ll notice that there are quite a few repeating plate values here. Our expectation is that this retooling will help address the range issues we’ve discovered, and stabilize higher Tier combat. We want our players to be challenged by tactics and strategy, not dice rolls. Onward and upward to playtest #5 we go! In battle, each Hero gets two Actions per turn. How the Hero spends those two Actions is entirely up to the Players. Some might use both Actions to move their Hero, while others may choose to move once, then attack, or attack, then move out of range. OR, a Player may use both Actions to attack twice. Near the end of our second playtest, our Overlord did exactly that. He commanded his Captain, Barbarius the Mighty, to use two Ability Cards against a Warrior: Rage 1 and Rebel Strike. This was an effective combination because it simultaneously buffed Barbarius’ Strength roll and debuffed the Warrior’s Defense roll. And the outcome was significant. The Overlord rolled 2 Strength (Attack). The Warrior rolled 1 Strength (Defense). Fierce 2 increased the Attack roll to 4, while Sundering 1 reduced the Defense roll to 0. This resulted in Barbarius dealing a whopping 4 Wound Points to the Warrior, slaying them in the process. We initially felt that the combo was indeed overpowered, and represented a critical balance issue that we needed to address. After all, it dealt 4 Wound Points, in a single turn, during a Tier 1 battle. At Tier 1, the average Wound Point limit is 5. But then we took another look a few days later and we realized it’s not that this combo was overpowered for the game; it’s simply extremely powerful for this particular point in the game. Once the Heroes are able to upgrade their Dice Plates, their Defense rolls will improve, and combinations like this one won’t be so devastating. Additionally, for a Character to play this Yellow-Blue combo, they would need to be dual-classed…as both a Barbarian (Yellow) and Warrior (Blue). You won’t find too many dual-classed Characters outside of the Overlord’s Captains right now…but one of our goals over the next six months will be to introduce dual-classing for Heroes. “Most of my crew’s been spaced. Look long enough out the observation deck, you’ll see ’em floatin’ by. Ain’t no way for a man or woman to die. I reckon there ain’t much dignity to be found in the black.